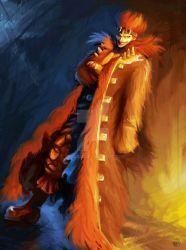 Bepo is part of Law's crew, the Hearts pirate in One Piece. He's a powerful pirate with a bounty of 500berries ! Colorization of the last page of the chapter 909 of One Piece. Roronoa Zoro is already bringing chaos at Wano Kuni, but he's so badass. Ace, we miss you brother ! Character from One Piece, manga by Eiichiro Oda. The chapter 907 of One Piece was full of surprise, a lot of fans almost died from heart-attack, I survived and decided to put this page in colors. Shanks is really charismatic, he go like this, in front of the Gorosei, with calm like nothing, and they seems to respect him a lot. I wonder not witch pirate he's talking about, but my question is, what's the relation betwin the world gouvernement Shanks, he's a pirate, normally they're enemy but they dont seems that much enemy here. Colorization of One Piece from Eiichiro Oda. Thank you so much for the fave!! Thank you for the watch! Must appreciate!